Faced with a projected revenue downgrade of $31 million, Gov. Peter Shumlin asked members of his cabinet Wednesday evening to come up with significant budget cuts throughout state government. During a press conference Thursday morning in his Montpelier office, the governor blamed the bad news on the lingering effects of the 2008 financial crisis — and economists' rosy projections about the pace of recovery. "We continue to recover, but this has been a slow crawl back from the worst recession in American history — and Vermont's not immune to that," Shumlin said. Though the downgrade to fiscal year 2015 revenue projections amounts to roughly 2 percent of the state's $1.4 billion general fund budget, the governor asked his secretaries and commissioners to recommend 4 percent in cuts throughout their agencies and departments. That's because he plans to spare the state's contribution to its retirement funds, as well as its debt obligations. He also pledged to avoid raiding the education fund or raising income, sales or rooms and meals taxes to fill the gap. 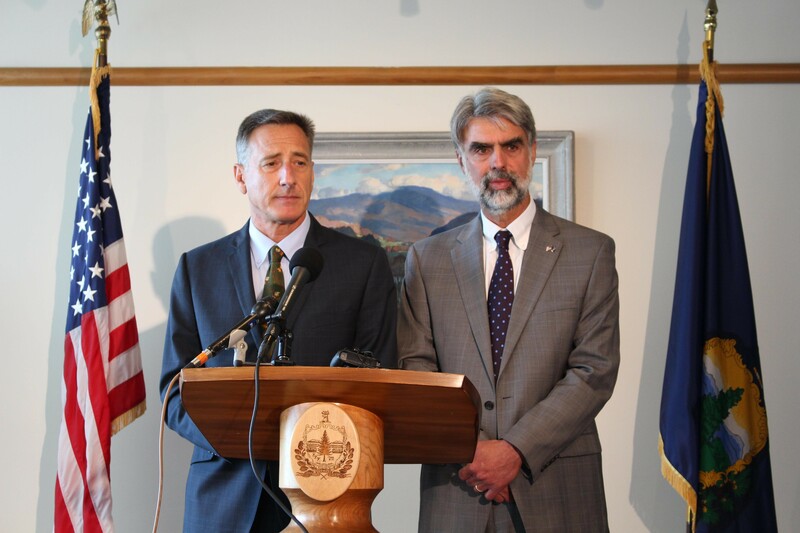 "We're not going to ask hardworking Vermonters to make this relatively small adjustment by raising revenue," Shumlin said. "Vermonters' taxes are high enough." The governor expressed confidence that his administration could find the savings without laying off state workers, though Secretary of Administration Jeb Spaulding said he had ordered an immediate hiring freeze and a reduction in discretionary spending. Shumin went to great lengths to downplay the severity of the downgrade and its impact on the state budget — at one point instructing reporters in attendance to "cheer up." He noted that revenues are still expected to increase by 3 percent this year — just not as high as the 4.8 percent his administration had anticipated. "This really is no different than when a family thinks they have a raise coming. They get a raise, but the raise is a little smaller than they had projected," he said. "The good news is it's July, not January. That gives us almost the entire fiscal year to make this adjustment." Shumlin plans to meet with the state's Emergency Board Thursday afternoon to brief them on the news and formulate a plan to address it. Later Thursday, members of the state’s Emergency Board, which includes top legislative and administration officials, formally adopted the new revenue projections. That set into motion a 21-day process during which the administration must recommend budget adjustments and the legislature’s Joint Fiscal Committee must approve them. The Emergency Board meeting attracted a healthy audience of state officials and reporters — and one unexpected guest: Republican gubernatorial candidate Scott Milne. The candidate departed before the meeting concluded and did not immediately return a call for comment. After the meeting, House Ways and Means Committee Chairwoman Janet Ancel (D-Calais) expressed optimism that officials could close the gap. “It seems like a lot of money, but we’ve solved bigger problems than this before,” she said.